It’s eight on a Sunday morning in August and I am out for my daily three-mile walk. The temperature is a comfortable 57 degrees, the sky is blue with just a few clouds to block the sun, and the lake is still and serving as a mirror for the pine trees that border the shoreline. Really, this is a perfect morning. My days of working 12-hour shifts in a restaurant kitchen are long gone. Those days that became weeks without any time off, function boards filled with banquet orders, restaurant reservation lists that groan with the weight of impossible service expectations, looming mise en place sheets, heated interactions with vendors, and the continuous process of trying to hire and train a staff team that comes and goes are just a memory. Yet, still I find much of my day consumed with restaurant work and thoughts of the food people and events that are so much a part of my life. I pass a neighborhood deli/catering business and see a team of servers in black shirts and pants, loading up a van for a cater-out. We acknowledge each other since in a small town everyone in the restaurant business knows each other or can at least recognize someone who is. I smile in recognition of the long day that is probably facing them and have mixed feelings of wanting to join them and thinking: “Sure glad I don’t have to go on this one.” My local coffee shop is closed on Sundays, so my routine is a bit off kilter, but the walk still energizes me and gives me an opportunity to reflect. Through my Apple ear buds I listen to Sting’s brilliant album: “The Last Ship” and really pay attention to the lyrics of a song entitled: “Dead Man’s Boots”. It is a composition that delves into following in his father’s footsteps, or in this case – choosing not to do so, and how, particularly in small communities this would be considered an expected right of passage. Ship builders children became shipbuilders, just as Pittsburgh steel workers children became steel workers, coal miners expected the same of their children, and mid-western farmers fully expected that their sons and daughters would continue on with the family acreage. The same had been true for ages with kitchen work. Chefs raised the next generation of cooks and chefs, and restaurateurs passed on the keys to the operation to their sons and daughters when the time was right. Things are different today. Younger generations want and need to cut their own path, find what makes them proud and makes them whole. This, of course, is the way it should be; yet at the same time, those traditions of old were somehow mystical and rewarding as well. In families where restaurant work was ever-present, younger generations witnessed the toll that took hold, the lost holidays, late nights, physically and mentally exhausted cooks, chefs, and restaurateurs and gave second thoughts to choosing this as their own life. Quite often the job came first, even before important family moments. At the same time, it was apparent that the family patriarchs and matriarchs truly enjoyed what they did. Whether it is the creativity, the sense of accomplishment, the good feeling that comes from working hard, or the camaraderie that was evident among those who work in a restaurant, there are many positive attributes to restaurant life. Still, is this the life that they want to live? There are plenty of examples of families who passed the keys to enthusiastic younger generations creating a legacy of cooks, chefs, and operators; Joe Baum and Lydia Bastianich are prime examples. But those family transitions seem to be few and far between today. Now, there was certainly some anger in the words that Sting wrote, anger about the assumption of transition to the same career, anger over the family suffering as a result of a father’s chosen career, and probably anger about how those family expectations drove a wedge between father and son, but at the same time he romanticizes a bit about those traditions. It was this reflection that brought Sting out of his writer’s block of a few years enabling him to compose this brilliant work. This is not a personal reflection for me; I am extremely happy that my own children chose their independent paths and they are doing quite well (although all of them started out working in restaurants). I fully appreciate how this career in food can be off-putting to many who haven’t found a passion for that type of work, yet know how gratifying it must be to see a family member walk in your shoes. 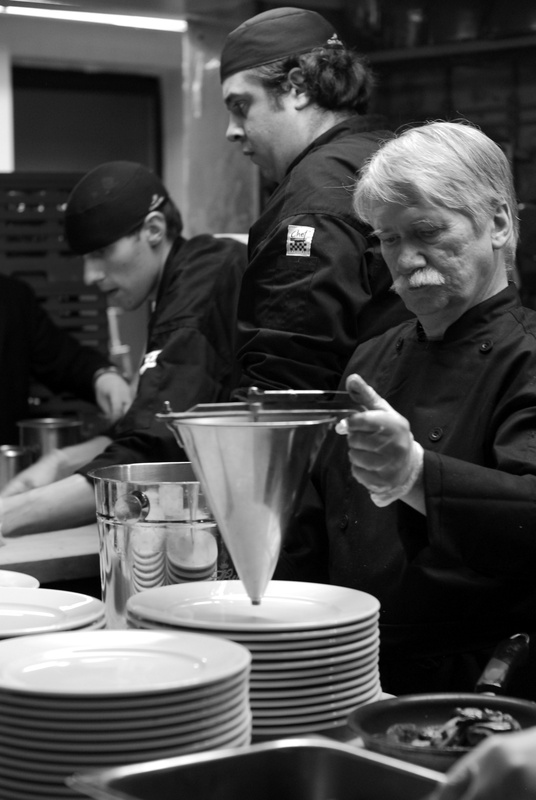 So, what is a cook’s legacy, if not realized through the chosen career of a son or daughter? Every cook, chef and restaurateur has an opportunity to lay the groundwork for fellow workers to make this their chosen career. Proper preparation through training, solid leadership, personal attention, and high expectations can lead to future accomplishments of those who we have an opportunity to mold. I am just as proud of the cooks that I worked with who continue to excel with their food careers as I am of my own children who have accomplished so much with their careers outside of the business. Those of us who have chosen a career in food and who hope to make a difference should simply look left and look right at the people who are just starting out in restaurants. Give them guidance, push them hard, expect more from them than they even expect from themselves, and give them the gift of a legacy in food. They may not thank you now, but they will at some point. I may not work on the line anymore and would likely find it a bit too much to put in consecutive 12-hour days, but the kitchen is in my blood. The people who work in restaurants and with every aspect of food have my respect and admiration. Many of them walk in my shoes or those of others who took the time to pass on a technique or standard. This is a legacy.